Coro Coro Comic turned 40-years-old this year. The premiere monthly manga magazine kicked off in spring of 1977. 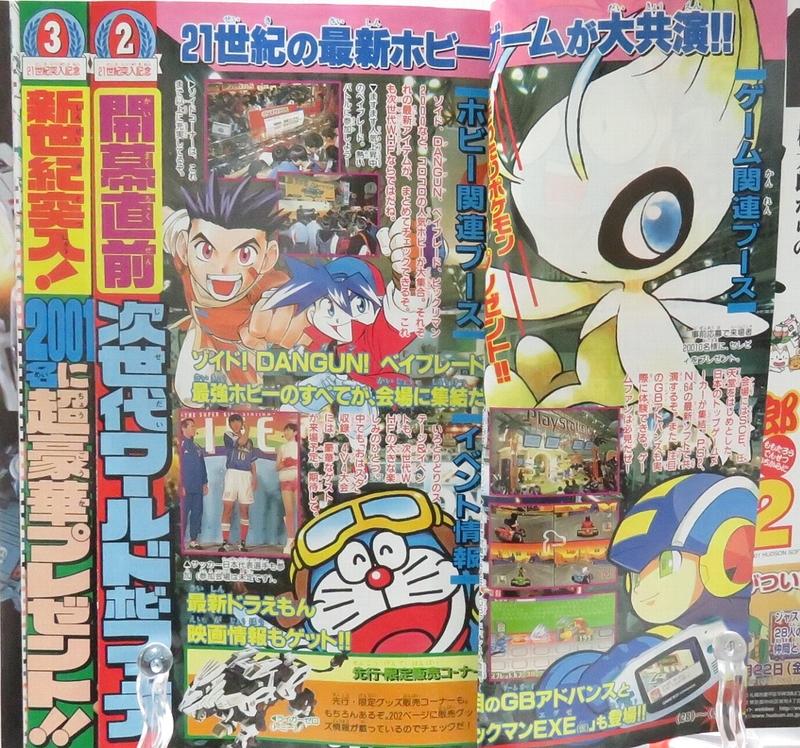 For four decades Coro Coro has entertained Japanese children with manga from Doraemon and Pokémon to Beyblade and Yo-Kai Watch. 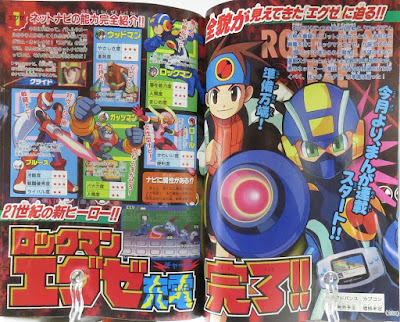 For many of us in the West, though, we came to know Coro Coro as the defining source for Mega Man Battle Network coverage. To commemorate the magazine that helped define Mega Man Battle Network for both East and West, let's dig up some old Coro Coro pages – let's go back to where it all began. Coro Coro briefly covered Mega Man games in the past but it was here, in its 269th issue (September 2000), they made their stake Battle Network. This issue was published in August of that year, a week or so before the Game Boy Advance made its debut at Spaceworld 2000. 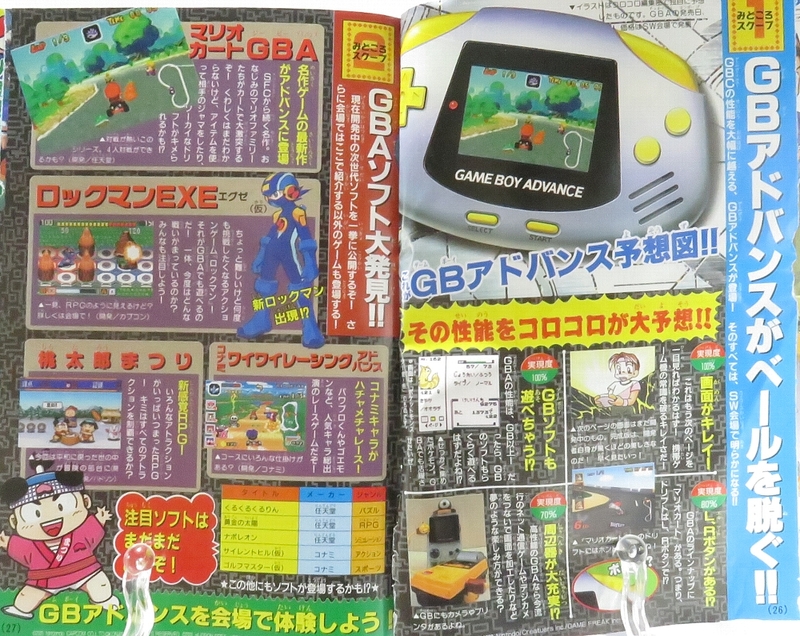 The right page shows a mock-up of the GBA based on preliminary information. 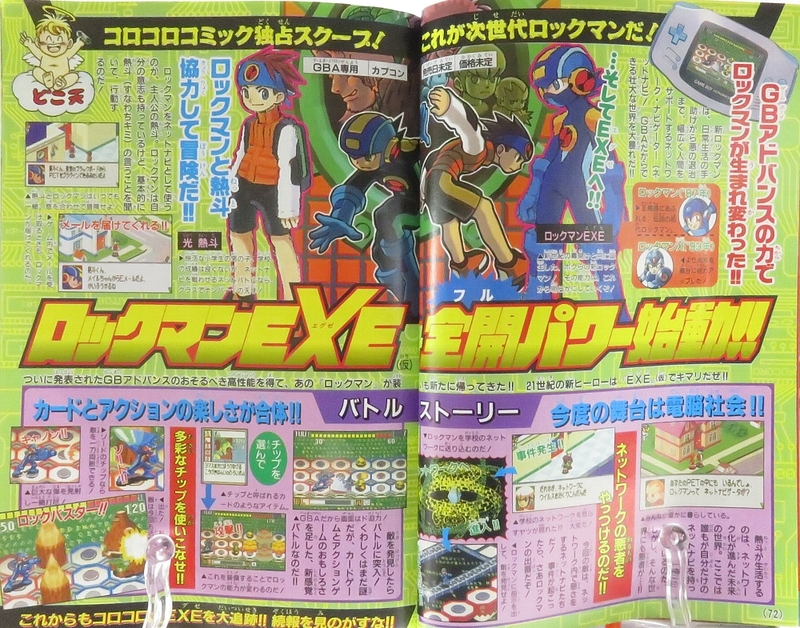 And on the left, well, there it is: the world's first look at Rockman EXE. I was 12-years-old when I saw that image on Mega Man Outpost. And I distinctly remember being none to pleased with it. 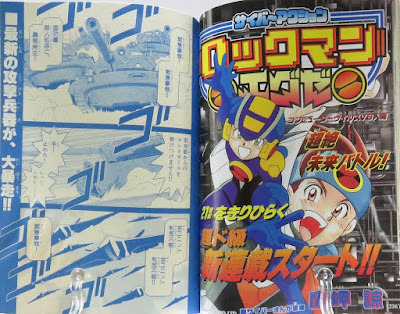 That's Mega Man? Why is he so skinny? What's hiding behind that mask? It grew on me over time, but I wasn't too sure what to make of it. The October 2000 issue featured a two-page spread of information. Holy cow, look at those graphics! The colors! Who's that other guy? Yeah, this is where I started warming up to things. I was sold on the GBA through Mario Kart but this really motivated me to start saving up allowance. At first I didn't realize the game was an RPG. I saw these screenshots and assumed it was a 2D sidescroller with isometric exploration. Or something. Is it weird I remember all this? Anyway, you've probably seen some of these beta screenshots before. On the left page you can just make out a very early Custom Screen window. I don't recognize that chip, either. The right page feature's Enzan's early mughsot. 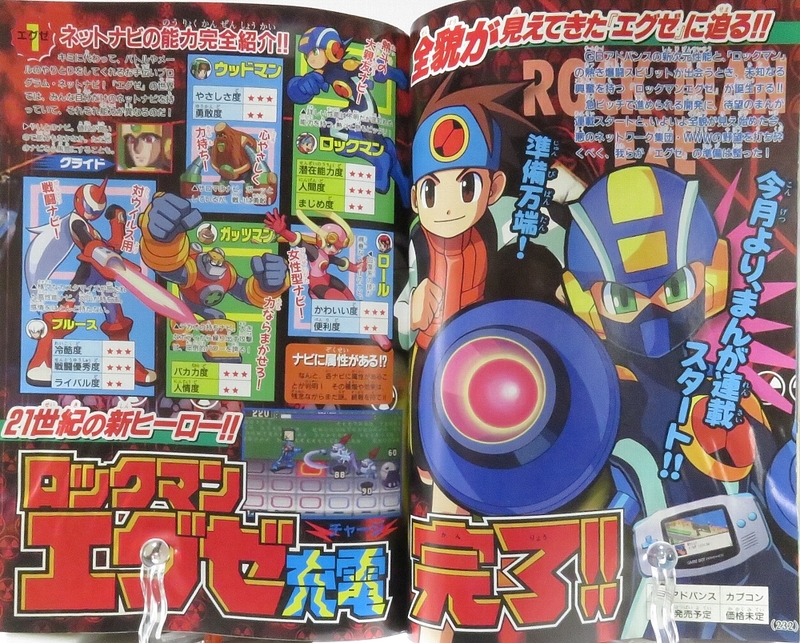 Rockman EXE was absent from the November and December 2000 issues. However, the game broke into the ranks of reader's most anticipated games. 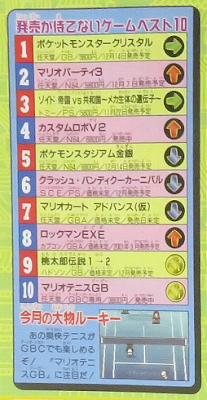 It placed 9th in November and 8th in December. Rockman EXE resurfaced in the January 2001 Coro Coro. 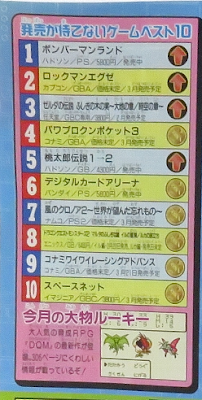 The game was two months away from release in Japan. To keep appetites whet, a demo event was declared for the 2001 World Hobby Fair. 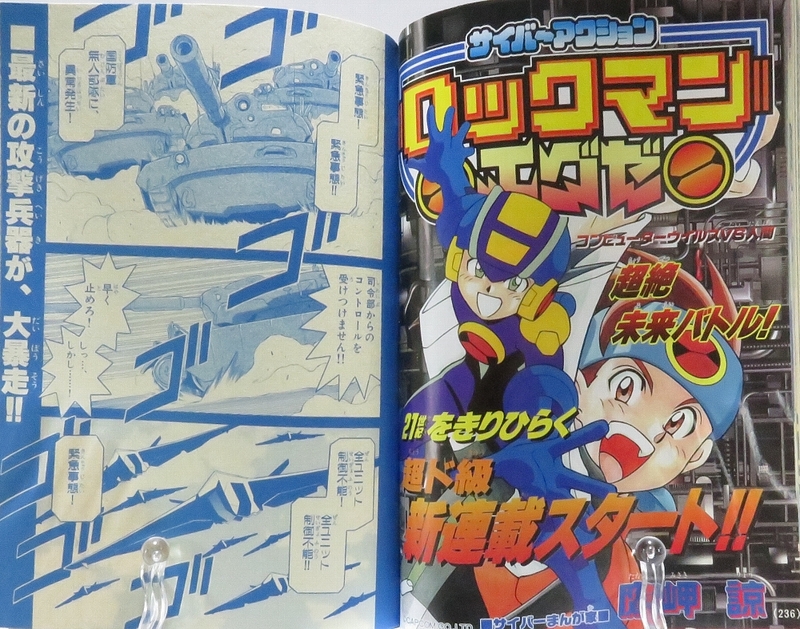 This issue also announced the serialization of Ryo Takamisaki's manga adaptation. 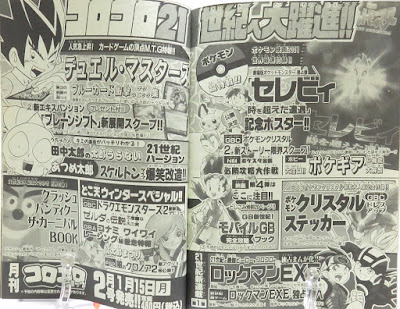 The February 2001 issue brought another two-page info blowout, a huge jump in reader rankings, and the very first chapter of Takamasaki's manga. The hype was in full-swing. 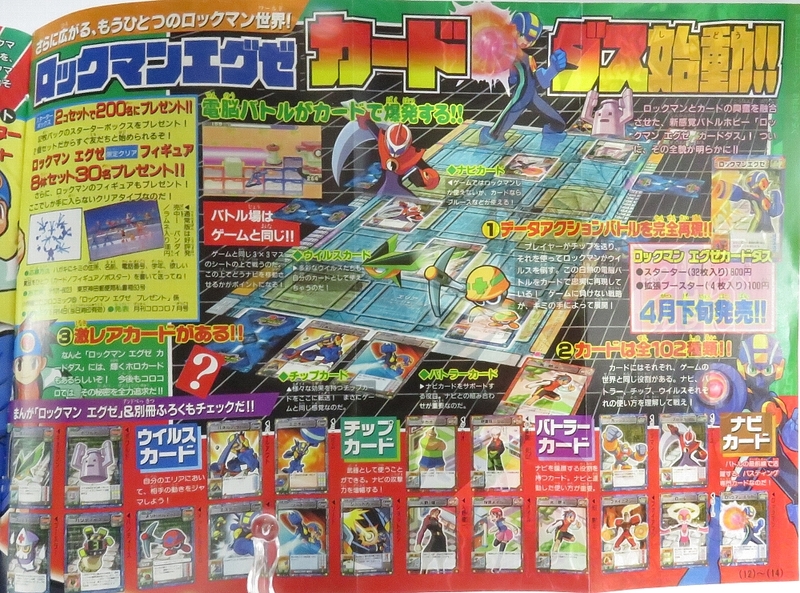 The March 2001 issue honored the game's release with a peak at antagonistic Net Navis. Deeper into the issue, readers were treated to a nice two-page ad. By now, we knew a whole lot about the game. Those of us who could import it to the West waited by mailboxes with baited breath. I, meanwhile, was toiling away on medial chores for that sweet $$$. June 11th, 2001 couldn't arrive sooner. 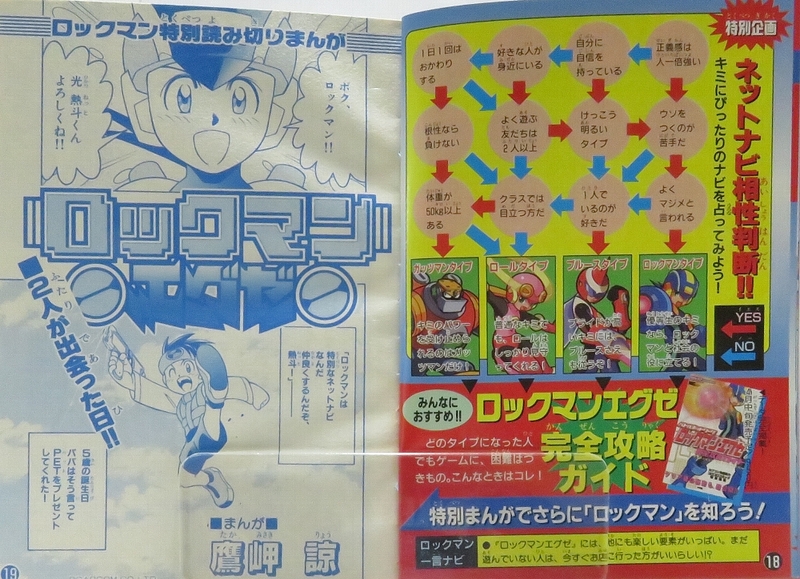 March, April and May 2001 issues brought tips & tricks, a look at the upcoming card game and – this is super cute – a personality chart to determine which Net Navi is better suited for you. 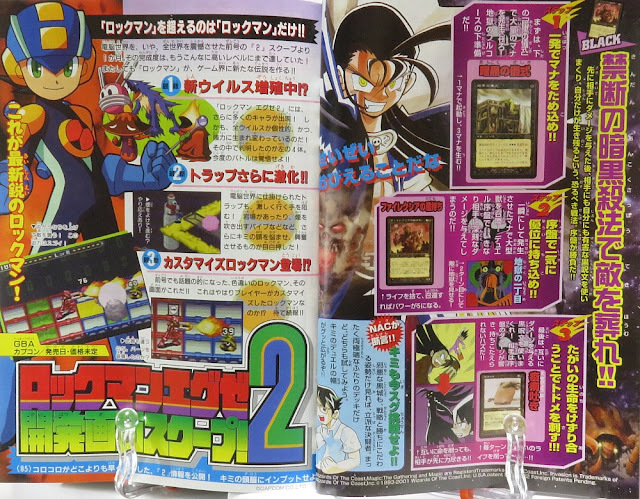 The August 2001 Coro Coro brought word of Rockman EXE 2. Style Change! New viruses! New chips! Yep; this was the news that really solidified Rockman EXE as an actual series. This wasn't going to be a one off, single game deal. EXE 2 was coming – I needed it bad. Oh, this was also the issue that introduced the world to Masakazu Eguchi's alter ego Meiji Eguchi (Mr. Famous in the West). Look at how young and spry he is. At the time these pictures were taken, he was knee deep in his duty as EXE 2's scenario planner. He would hold that title for the next several games. And the rest is history. Coro Coro maintained a longstanding relationship with Capcom in the years that followed. From 2000 to 2009 the magazine continued to act as the premiere source of Rockman EXE and Shooting Star Rockman news. In the end, coverage concluded with Rockman EXE: Operate Shooting Star. Looking at these pages today is all too nostalgic. 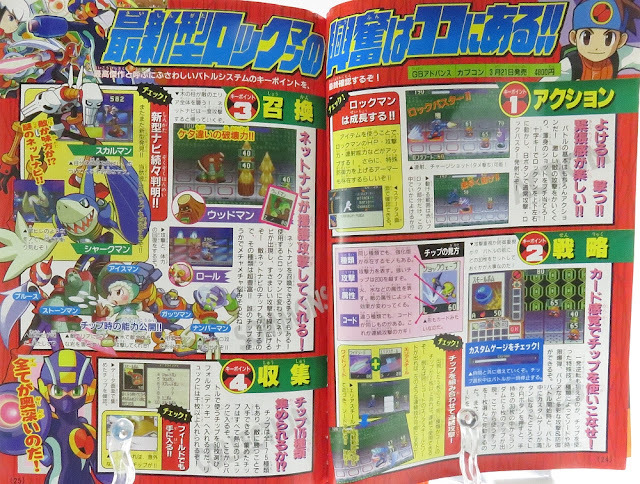 I remember hanging out at Planet Mega Man waiting for the latest scans to drop. The summer months were the most exciting. From May to August, Coro Coro brought word of *new* Battle Network games. It was awesome. A far cry from the Mega Man news climate we face today. 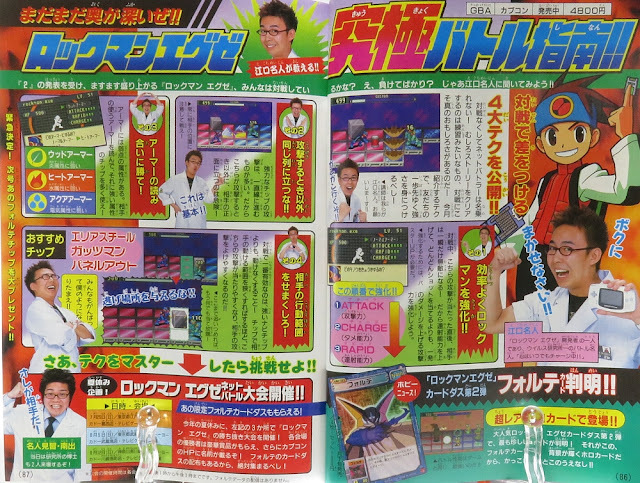 I have a big folder on my drive full of old Coro Coro scans. I've been collecting them for years, mostly through the magic of the Way Back Machine. When I'm satisfied with it I'll be happy to put it up for download. In the meantime, you gotta check out this site. It's an excellent source. Well, that about does it for this nostalgia trip. So here's to you, Coro Coro. Thanks for the memories. Damn good times. 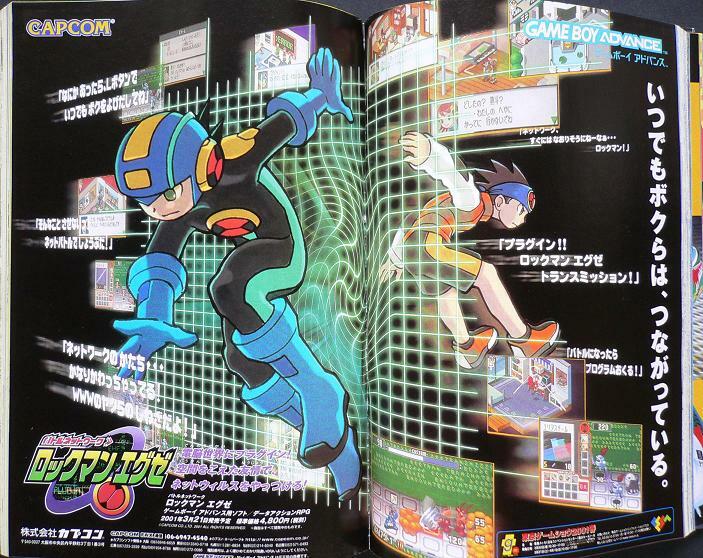 I remember seeing MMBN in Nintendo Power or something similar and thinking it looked really sweet. 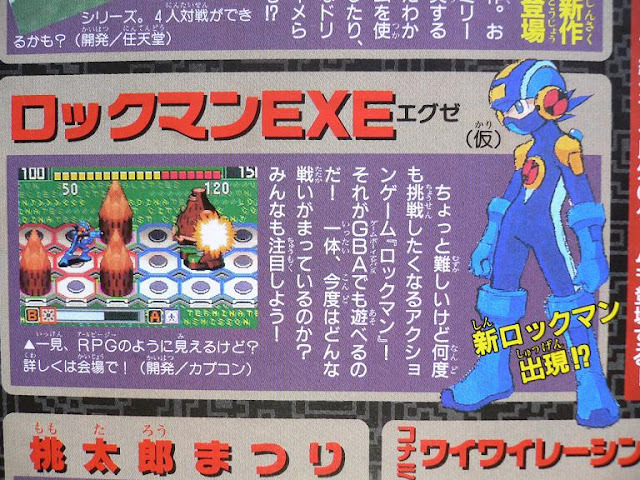 At that time I had only played MM1 and X4, but I already got the feeling of nostalgia seeing characters like Fire Man in it. Ended up getting it for Christmas that year, and it was great. I figured I should comment on the most recent one, so sorry if this counts as spam. I've emailed Capcom and tried to ask them if fangames were legal or not, and if they would take ones like Mega Man 2.5D down. The representative told me over a few emails, the only thing that they said was that Capcom did not allow licensing requests and that the tech support line did not cover or comment on fangames. So they directed me to the Facebook, Twitter, and YouTube accounts. I'll try those, but could someone such as Protodude please try and get in contact with Capcom to get a statement on whether unlicensed fangames are illegal or not and if they will DMCA them like Nintendo does? Thank you so much, I hope as this is a popular Mega Man hub this will be a good place for a statement to be published and shared if Capcom makes one. I can safely say that do not take down fan-games. As long as a fan-game is not for profit, they don't mind. We've had fan-games for years with no trouble at all. You're good. Thanks. Has anyone ever asked Capcom about it directly? I know there's a difference between "we openly approve" and "don't tell the company directly", and the latter makes me feel a little squeamish because I hate having to hide things or be in the shadows. So I meant I wanted to have legit permission because that would make me feel better and secure. I know they said that they don't hand out licenses, but I wanted them to say if they consider unlicensed fangames to be illegal. The tech support line couldn't say due to their scope (tech support only), so I'm trying to find it out for myself or ask someone with a big community precense such as yourself to ask them because you have more clout. Didn't they help that fan game for megaman and street fighter a few years back? 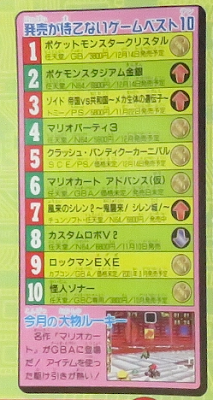 Also, I'd like to say (because I can't edit my comment yet) that I'm only doing this because people say that Capcom allows fangames, but there hasn't been an official record yet, so I'm trying to get one so that we Mega Man fans know that we are only doing legal things. Thank you. Christian Svensson, Capcom's former SVP, has gone on record to say it's okay as long as it's not for profit. That was some time ago but I still stands. MM2.5D, 8-bit Deathmatch, etc. would not be live today if that weren't the case. 1. Doesn't he not work there anymore? 3. That seems more like your older brother promising not to tell your parents you drank a beer, not your parents letting you have a beer, if you catch my drift. I'm afraid that some past life experiences have made me not want to hide who I am. Did you ever get in touch with them or know somebody else "famous" who wants to (Rhythm, ACESpark. Etc.) Thanks. I hope we can get them to adopt a stance like SEGA's. 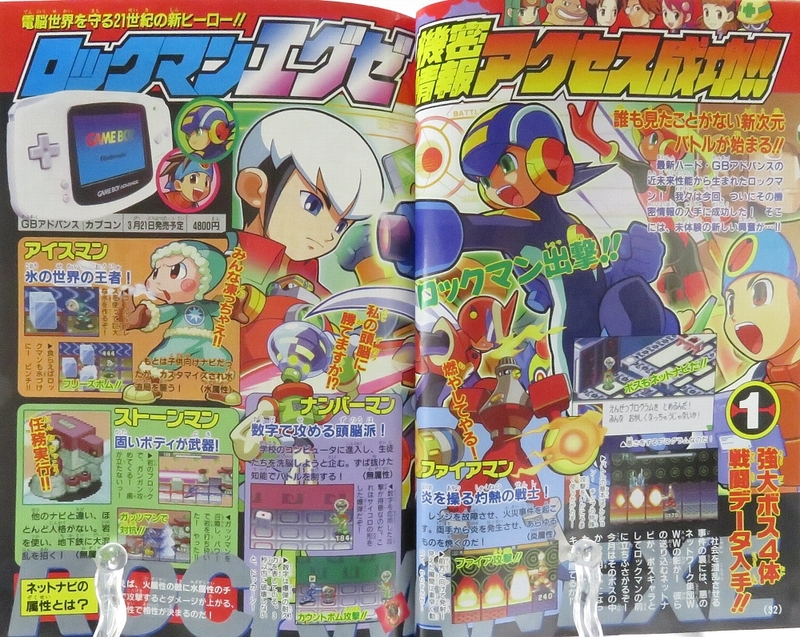 I remember Coro Coro and Planet Mega Man well. 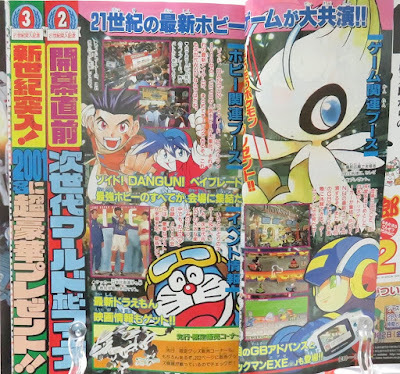 From 2003-2005, I was living in Japan and would help out The Mega Man Network (I was on their forum/IRC since my high school days) by running over the local store to pick up the newest issue to scan. While there were a few times I beat them to the punch, for some reason PMM always seemed to have the one-up on me. Did they have someone living in Japan as well? I never really knew, but having a full-time job didn't help my chances. I'm wondering if any of your scans from the summer of 2004 were from me! Those were the days. I might! 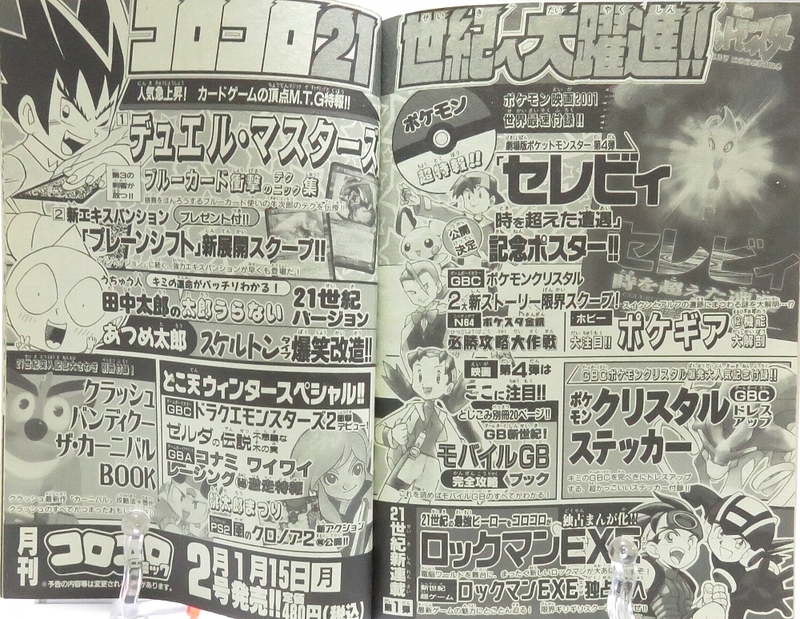 I have scans from Fireman. Is that you? No, I was Dash2110. Fireman was with PMM, while I was over at MMN. As I mentioned, it was few and far in-between when I got the scans over to our site admin and he put them up on the site before PMM got theirs up. I guess I can pop over to the Way Back Machine to check. Hopefulyl soon we are back to megaman being a thing like it was before. I got that vibe that it may comeback hitting harder and better then before. I still remember this, was crazy when discover that you can make more Program Advances than Z-Cannon, specially the Guts ¿Shot? 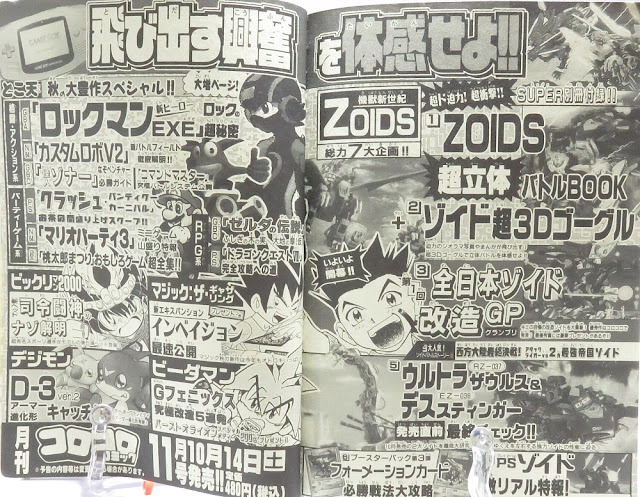 that appears in the Coro Coro pages. 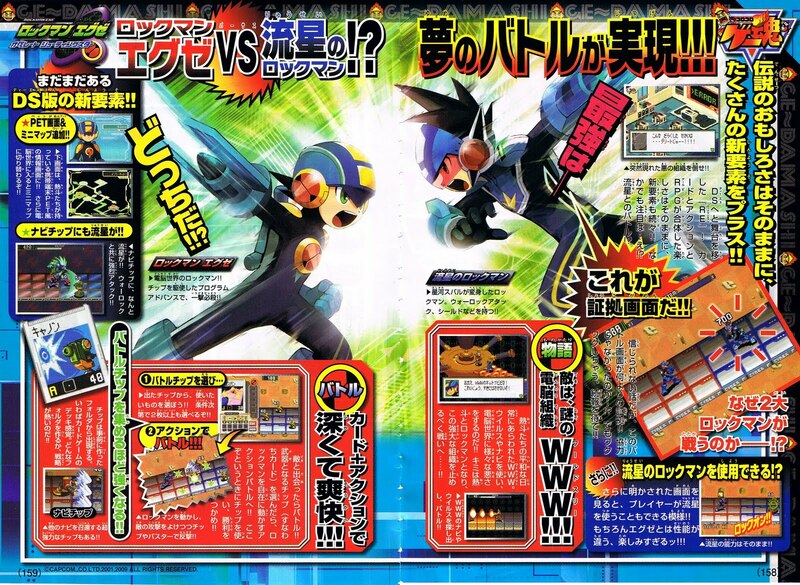 Anyone remember that promotion poster that showed MegaMan.EXE and Shobu from Duel Masters? Shobu apparently appeared in the Program of Light and Darkness movie. Has anyone seen the movie and confirm that? It's always been a curiosity to me. IIRC, Shobu wasn't in the movie but appeared with Lan in the brief, 30-sec intro. And trailers. I saw MMBN for the first in time in the swedish Super Play magazine. There were only two screens, one of a battle and the other of Lan's bedroom. I remember fantasising about this game alot! And the game was so great when I finally got to play it. That old pre-final art though. Reminds me of when I found the demo end screen in BN1. Notice how MegaMan has those "helmet-cheek" things in that weird jumping art that isn't present anywhere else.